AntiWacko's World Views | For right thinking people, who are blessed with inquisitive minds and common sense. There is a big difference between a true patriot and the fake patriots, who are quick to place their hands over their hearts and wave the US flag, yet do all they can to destroy Americans’ lives. It’s about time Americans learned the difference. 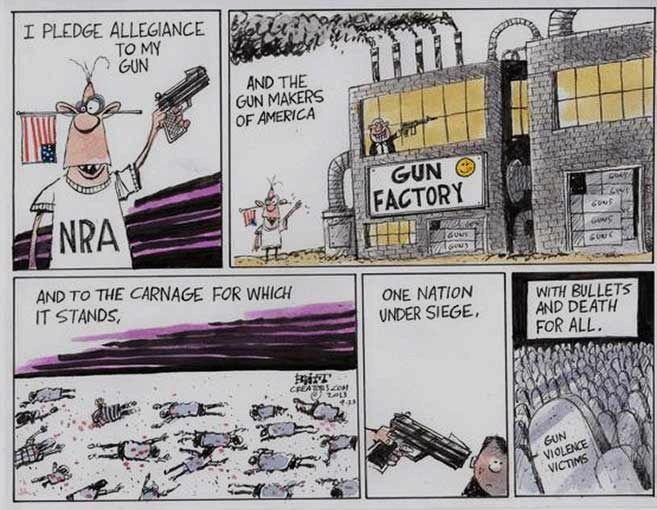 This may be humour but, from what I see coming from the National Rifle Association (NRA), it’s close to truth. The carnage that firearms and irresponsible firearms owners have brought to America is horrific, by all civilized standards, but far too many Americans are obsessed by the thought that they are modern cowboys or an incarnation of “Dirty Harry”. Shady TEApublicans Paul and McConnell Add National ‘Right to Work’ Amendment to ENDA Bill. Senators Mitch McConnell and Rand Paul stepped up to the plate on ENDA, today! The two have announced that they are fully in support of…attaching…Right to Work…language…to…the…bill. ENDA, or the Employment Non-Discrimination Act represents true protection for the LGBT community in the workplace, protecting against discrimination based on perceived or actual gender identity or orientation. ENDA is supported by over 70% of Americans, including 81% of Democrats, 74% of Independents, and 66% of Republicans. Even among people who think gay people are icky, there is 50% support for ENDA. In other words, this one is a no-brainer. With such wide public support, and strong support in Congress as well, nothing can screw up this chance for our LGBT brothers and sisters to be treated fairly in the workplace…right? Determined to screw things up, Mitch “The Turtle” McConnell and Rand “Footnotes” Paul have proposed an amendment that would tack Right to Work language onto a bill designed to lessen workplace discrimination against a group of people who sorely need the protection. Paul and McConnell’s illogical proposal would add language that prevents companies and labor unions from entering into contracts that require that all employees share the cost of collective bargaining (the Union fighting for workers’ rights). Right to Work legislation significantly weakens unions by effectively draining funding away from them. Since all workers are not required to pay their fair share toward collective bargaining expenses (yet the Union is still required to fight for all workers), it increases members’ costs and –since Conservatives enjoy the claim that money is free speech — lessens the union’s ability to practice its First Amendment rights. Democrats and Republicans in the House of Representatives just passed a law written and paid for by lobbyists for Wall Street banks. They sold us all out, so we’re demanding they step down. The U.S. House just passed a bill called H.R. 992 — the Swaps Regulatory Improvement Act — that was literally written by mega-bank lobbyists. It repeals the laws passed in 2010 to prevent another meltdown like the one that crashed our economy in 2008. The repeal was cosponsored by a former Goldman Sachs executive and passed with bipartisan support from some of the House’s largest recipients of Wall Street cash. It’s so appalling… so unbelievable… so blatantly corrupt… that you’ve got to see it to believe it. Read the full story here at Represent.US and then ask President Obama (@WhiteHouse) to veto the Bill if it is passed by Congress. You can also contact Senators Harry Reid (@SenatorReid) and Elizabeth Warren (@SenWarren). He went on: “It’s just like evolution. You know most Americans have their head in the sand about evolution. He believes that the Government is trying to destroy God, or, at least, his version of God. 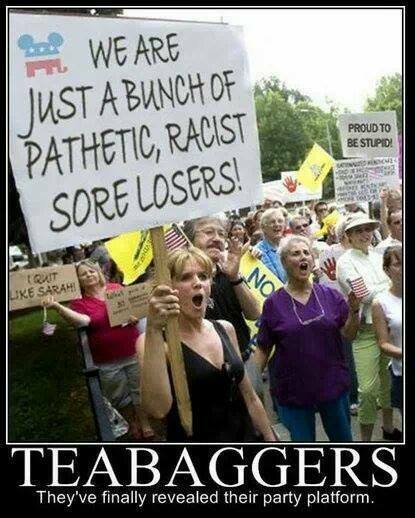 Tea Partiers exposing their true character. Many books will be written about the insanity, cynically self-labelled the Tea Party, that infected America in the early 21st Century. 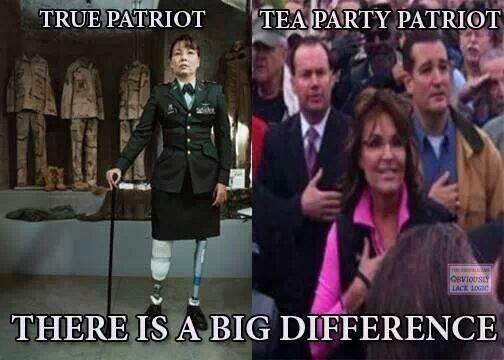 The biggest hypocrisy of all is that they call themselves “patriots”.